What could be more delightful to contemplate than a leisurely and peaceful sojourn viewing the beautiful area of Orford Ness from the river whilst dining in style aboard the ex-Admiralty MFV supply boat, the Lady Florence River Cruise Restaurant? 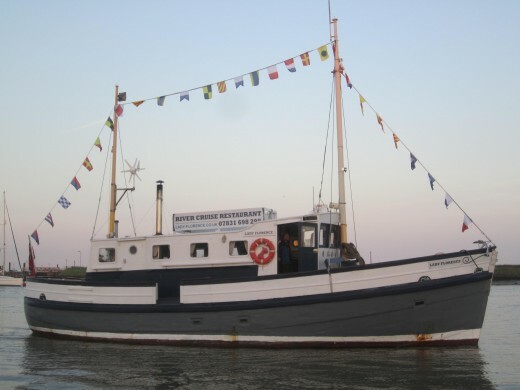 Lady Florence commenced cruising the calm waters of the Rivers Alde and Ore over thirty years ago, and 2014 celebrated her 70th Birthday. She is an historic wooden ship, and is indeed registered with the National Historic Ships’ Register. 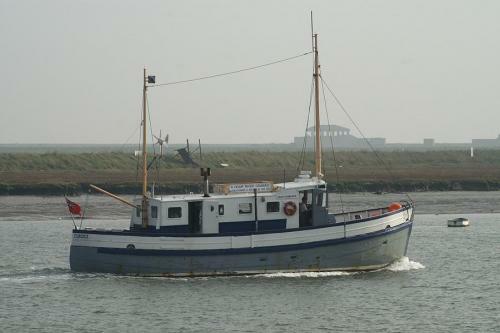 She is one of over eleven hundred motor fishing vessels (MFVs) built by the Admiralty during World War II. It may seem anomalous that the Admiralty should build fishing boats during wartime, but when war was declared in 1939, the fleet was ordered offshore to avoid being bombed by enemy aircraft. However, the Admiralty had never needed supply boats to ferry provisions and personnel to vessels offshore, as during World War I, bombing from aircraft was very primitive, small bombs being dropped over the side of the aircraft by the observer. The Admiralty had to commandeer whatever private boats they could find to fill this requirement. By halfway through the war, half of these boats had been sunk, since they were never built for all-weather operations and high seas coming alongside battleships and carriers. The design that stood up best was the fishing boat, hence the 1100 MFVs. The Admiralty hoped to sell these vessels after the war to replace fishing boats lost during the hostilities, and many did go to fishing. MFV766 is fifty feet long, sixteen feet six in beam, draws six feet of water and weighs 35 tons net, 54 gross register. She is now powered by a 120hp six cylinder two-stroke diesel engine built by Foden, and has had a Foden engine since 1953. She serviced battleships from Plymouth, then moving to Portsmouth with the Royal Marines’ Cliff Assault Wing Commando. Subsequently she served with the Midhurst Sea Cadets, then the Hove Sea Cadets, before being sold into private service around 1970. She was owned by an engineer from Manchester in 1977, when she became a Registered British Ship at Lloyds, Official Number 361575. She was bought in Woodbridge by Geoffrey Ingram Smith around 1983, and he set up the Lady Florence cruise operation in 1984. Geoffrey retired in 1992, and John and Susan Haresnape bought the business and expanded it, becoming international in 2002, by setting up the Allen Gardiner Harbour Cruise Restaurant on Durban Harbour, with a 1942 wooden ex-South African Air Force air/sea rescue launch. Son Craig and his partner Kris have subsequently taken over managing both businesses, keeping the businesses within the family for 22 years. Craig said “We decided in 2012 to consolidate both businesses in Suffolk for ease of management and economies of scale. In addition, Kris and I spent much of our time ‘fighting fires’ as crews went astray in our absence. So during 2013, we shipped the Allen Gardiner to Suffolk, and she now operates on the River Orwell from the Wet Dock at Ipswich’s historic waterfront”. Aboard the Lady Florence, however, you are sure to enjoy a stylish dining experience with a stunning natural backdrop. This mysterious, historic and unearthly part of Suffolk could not be seen in more apt or comfortable circumstances than from aboard the Lady Florence, cruising the calm waters within the Rivers Alde and Ore for either two-and-a-half or three-and-a-half hours. The fifty foot Lady Florence carries twelve passengers in spacious comfort, so you might want to make up a party of your own, or join up with others for a brunch, lunch, dinner or a sunset supper cruise. Unlike many tourist attractions, the cruises operate all year round, including Christmas Day, regardless of weather and tides, with a cosy coal fire in winter. An informative commentary, providing a wealth of information about the area from early times to sinister wartime events, brings the fascinating area to life, and is given throughout all Lady Florence cruises. As the award-winning Lady Florence cruises the rivers, you will be served fine wines and food from the a la carte menu, freshly prepared on board. Dishes are served in the elegant dining saloon and include local fresh produce including items from Orford’s two smokehouses. For further information, colour leaflet about both Lady Florence and Allen Gardiner, or to make a booking, telephone 01473 558 712 or 07831 698 298 or email info@lady-florence.co.uk or info@allen-gardiner.co.uk.